So we all have realized how big data and the digital world is transforming everything in our lives. Data has quickly changed this analog world we used to know, into a digital one. It has disrupted the way in which we live our daily lives. 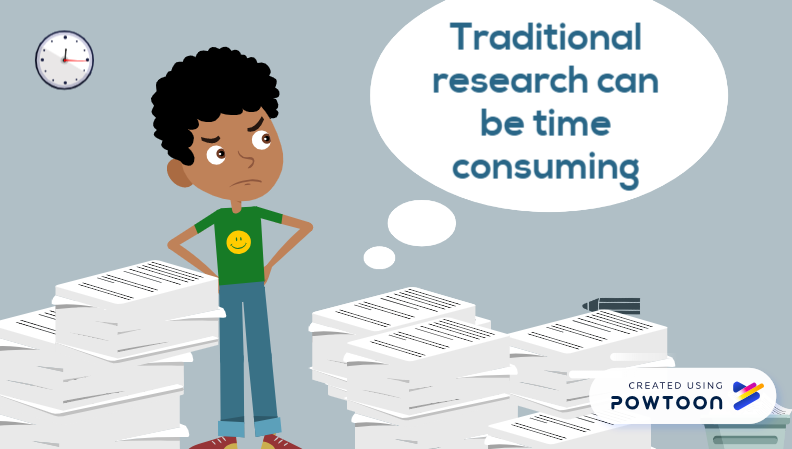 We have moved on from sending a letter via the postal service, to simply sending an email; from typewriters to keyboards, and from skimming through books of literature to accessing information through network technologies, what we now know as e-Research. 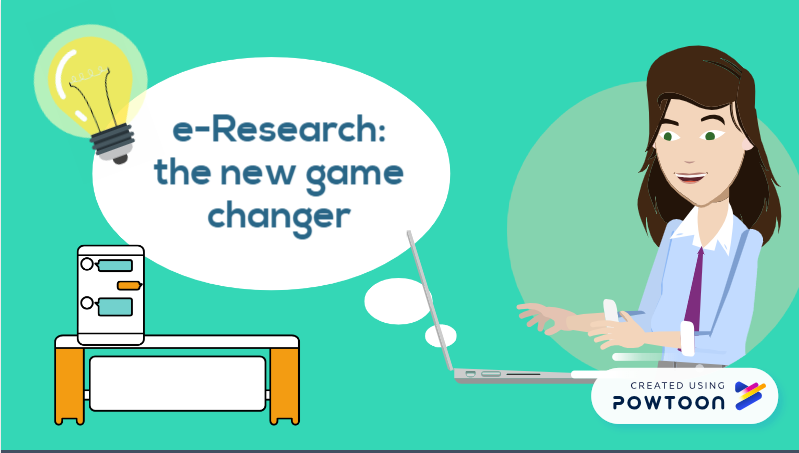 e-Research is the new game changer in the research world. In this world of big data, e-Research allows researchers to explore new opportunities by supporting, sharing and collaborating their research in a global context. This is made possible due to the use of the virtual environment and advanced computer networks. Meet Ru. Ru is a potential researcher but is a late adopter (laggard) when it comes to technology. He is still using “manual” means of research which is paper heavy, harming the environment. Ru’s main aim is to make his research discoverable. However, he finds this process exhausting in terms of cost and closed access. approach. She wants to make her research accessible and transparent globally so that her research can be shared and cited. Nelly is also hoping the results of her research can be reused by another researcher to make new discoveries. 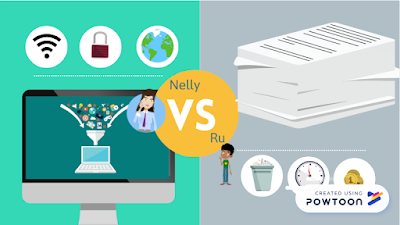 She finds the process of accessing research articles a pleasure as it involves very little cost and she can choose from millions of research papers globally, at the touch of a key. 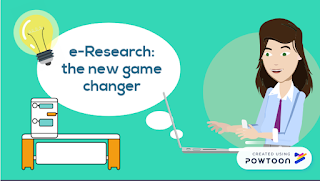 e-Research refers to the extensive and intelligent use of technology to support research, making research more efficient and allowing research to be more collaborative across geographical limitations. “e-Research technologies enable researchers to create and collect, analyze, preserve and publish digital research data, and to work collaboratively in virtual teams that cross disciplinary, institutional and national borders by using Virtual Research Environments (VREs)” (Aims.fao.org, 2018). Researchers, authors, publishers and scholars are now collaborating and engaging at unprecedented levels. This is made possible with super highly advanced networks, transferring and sharing of scientific knowledge and extensive data storage that allows researchers from different areas to collaborate on one common world playground. “In e-research, it is the primary research data that must often be managed, made accessible and curated” (O'Brien, 2005). Why is it important for the UKZN Research Community to engage with e-Research? • To preserve and manage data through UKZN data repositories such as Research Space and Open Journal Systems (OJS). ResearchSpace – is the UKZN institutional repository established to upload and preserve all UKZN research that is digitally accessible. Click on research space to open the link. Open access publishing has a critical role in e-research as it allows peer reviewed scholarly research to be freely available to anyone. Researchers from UKZN using the open access platform can possibly, with the aid of the Research Data Management tool, collaborate with international researchers in multi-disciplinary fields and publish papers thereby helping UKZN to accelerate its research output. OJS (open journal systems) – is UKZN’s recently launched open access system which allows UKZN researchers to openly publish their data. Using Google analytics on user traffic to the Open Journal Systems website (OJS), it can be seen that the number of users has grown since the launch of the site. The site has had 72% new visitors so far and on average each new user had two sessions on the site. It has also had its first submissions since the launch on 22nd October 2018. Figshare - is a Research Data Management tool that allows researchers to publish, share and get credit for their research data, including hosting videos and images in a cost-effective way. UKZN is employing Figshare to manage all data from its repositories and from individual researchers and to make some research private, while allowing the Institution to meet funder requirements for open access content (Researchdata.berkeley.edu, 2018). By creating a public portal and assigning digital object identifiers (DOIs), Figshare can make UKZN's research products searchable, discoverable, and citable, and their impact can be captured through detailed statistical reporting. Please click on open journal systems to access OJS. A review by Zhang (2014, 11) concludes that “current literature has been overshadowed by research with a strong technical emphasis, focusing on large-scale collaboration, and takes a quantitative approach to studying the quantitative impact of technology use in the distributed research of sciences.” With this digital world exponentially growing, a byproduct of that is data, and data has the power to unlock true wisdom. 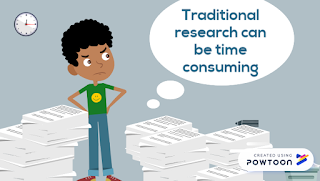 e-Research without a doubt forms that fundamental foundation to help us collaborate research to achieve that stage of knowledge in our academic endeavours. Research together with high-end computer software helps set the stage for collaboration at UKZN to be discoverable and create synergies. 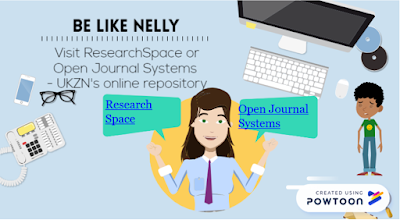 So, be like Nelly and adopt the new ways of working with e-Research via UKZN’s data repositories and any other free open source systems globally. Aims.fao.org. (2018). Göttingen eResearch Alliance about eResearch related questions and Data Management issues | Agricultural Information Management Standards (AIMS). [online] Available at: http://aims.fao.org/activity/blog/g%C3%B6ttingen-eresearch-alliance-about-eresearch-related-questions-and-data-management [Accessed 2 Nov. 2018]. O'Brien, L. (2005). E-Research: An imperative for strengthening institutional partnerships. [online] EDUCAUSE Review. Available at: https://er.educause.edu/articles/2005/1/eresearch-an-imperative-for-strengthening-institutional-partnerships [Accessed 2 Nov. 2018]. Powtoon.com. (2018). [online] Available at: https://www.powtoon.com/index/ [Accessed 2 Nov. 2018]. Researchdata.berkeley.edu. (2018). Figshare Research Data Management. [online] Available at: https://researchdata.berkeley.edu/tools/figshare [Accessed 8 Nov. 2018]. Research Data Alliance (2014) The Data Harvest: How sharing research data can yield knowledge, jobs and growth, An RDA Europe Report, December 2014, available at: https://europe.rd-alliance.org/documents/publications‐reports/data‐harvest‐how‐sharing‐research‐data-can‐yield‐knowledge‐jobs‐and growth [accessed 01/11/18]. Van den Eynden, V. and Bishop, L. (2014) Incentives and motivations for sharing research data, a researcher’s perspective. A Knowledge Exchange Report, available at: http://knowledge--‐exchange.info/Default.aspx?ID=733 [Accessed 2/11/18]. Zhang, J. (2014) Scholarship before technology: Re-thinking the relationship between technology and scholars. Journal of Communication and Education, 1(1), 3-15. UKZN Library. Simple theme. Theme images by luoman. Powered by Blogger.